For some reason, my wife doesn’t like me going out to seedy bars anymore and talking to strange women. Marcy(my wife) and I have been together(off and on) for 29 years. Some really good times and some pretty rough. The same can be said for my relationship with my girlfriend, a 1946 Stinson 108-1. She turns 70 on October 31st this year and to celebrate, my guess is we’ll go flying. I started taking lessons back in 1981 and was ready to solo the next weekend when my boss walked in and informed me my services wouldn’t be needed anymore as a telephone installer. Fast forward about 10 years and I’m working for a TV station directing the 6 and 10pm news. The money’s is flowing again, so back to the airport I go. 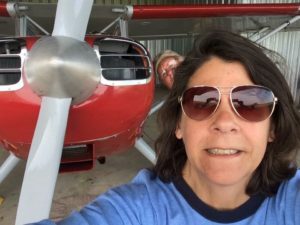 I earned my private in an old, well worn Cessna 152 flying off a little grass strip that’s no longer there, then progressed on to get my instrument, commercial and multi engine ratings. One Tuesday afternoon at the TV station, the boss walked in and asked how my commercial rating was going. Turned out the corporation had decided to do some downsizing and after 18 years of service, my name was at the top of the list. The commercial rating got me on flying part time co-pilot for a local corporation in a King Air 200 while I also worked part time producing TV commercials for the local cable outlet. A couple years later, I started my own business doing video production and eventually sold it to a local advertising agency where I now work. During that time, my father had also passed away and mom wasn’t doing so great herself, so flying once again went on the back burner. Marcy and I had split up 5 years before and we’re now back together. We had bought a small farm in the country that was just a few degrees west of the approach and departure of runway 4/22 of our local airport. I started realizing that every time I saw a plane go over, I was making a gesture at it with one of my fingers because I was jealous of someone besides me being in the cockpit. I knew I had to get back into flying, so after several months of searching, I hit upon a 1946 Stinson 108-1 on eBay with the help of a good friend and flight instructor. Within a week, I owned it. A year later, at my first annual, we started finding problems with the engine, a 150hp Franklin. Nothing that large sums of money and infinite patience couldn’t solve! In researching the planes past, it appears that one of the previous owners(now deceased) did his own overhaul on the engine. Apparently, he wasn’t that well versed in engine repair and maintenance. 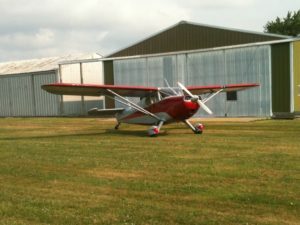 It’s now nearly 6 years into my stewardship of this aircraft and things are running great with the help of a local A&P/IA that also owns a Stinson. Thanks Jack! A few rough years and now everybody’s happy and well adjusted. There’s always room for improvement and maintenance, but overall, the wife, the girlfriend and I all have a great relationship that I hope lasts until the day I depart and head west. So, happy birthday sweetheart(s), Marcy in July and my girlfriend in October. I love having you both in my life more than I can say.